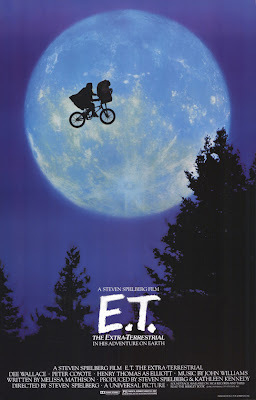 One of the greatest buddy movies of all-time, Steven Spielberg's E.T. (1982) makes my list of Desert Island Flicks for numerous reasons. E.T. was one of the very first movies I remember seeing as a kid. It seemed to perfectly capture the adventure and mystery of finding an alien while maintaining the perspective of a wide-eyed kid like Elliott. It made the world seem bigger, while reminding us that there's nothing quite like home. 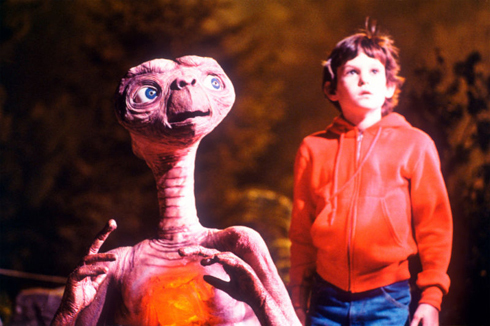 The unlikely friendship between Elliott and E.T. is just as entertaining and heart-felt today as it was over 25 years ago. Finding a movie that holds up from childhood to adulthood is rare, and in my experience is full of more disappointment than surprise - but maybe I was destined to love E.T. from the beginning. As a kid, even before I even knew E.T. was a movie, we had various E.T. toys in the house. Born in 1984, my age timed me well for the releases on VHS. If E.T. was good enough as a plastic figurine, it was only cooler when I first saw him move. "I believe in a good time as well as a thought-provoking challenge. I have always said that the best films are those that manage to be both (and by “good time,” I mean a laugh and a cry, because, let’s face it suckers, we secretly love to cry at the movies). “E.T.” may not be an intellectual’s smorgasbord, but it does showcase a director at the very top of his game. 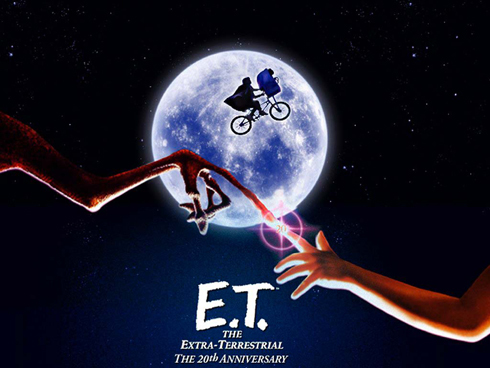 By the time Spielberg made “E.T.,” he had learned all his lessons from his previous hits (“Jaws,” “Close Encounters,” “Raiders of the Lost Ark”) and misses (“1941,” which I know is debatable). For this movie, he turned inward, put his camera at child-eye level and went for the quiet moments whenever he could. And, still, he didn’t let us leave the theater until we felt as though we had just been on the greatest roller-coaster ride of our lives". Spielberg is what pulls me even closer to this film now. What I've always respected in his work is, quite simply, his storytelling. Be it dinosaurs, sharks, raiders or aliens, it all makes me feel like I'm watching the work of someone who really knows what it's like to dream big, to imagine, and to take full advantage of what the movies are and can be. There's no doubt that E.T. embodies this spirit. I think Spielberg's intent is to surprise and please his audience by building on classic concepts and universal themes - friendship, love, loss, growing up, etc. His characters and subjects have been constructed (sometimes literally) so well that they become destined for countless pop culture references. As one of the most bankable directors in history he's clearly been doing something right, and I find it inspiring to immerse myself in the work of a director that managed to take the mainstream route to success without sacrificing quality or originality. E.T. is a simple but powerful story, with endearing characters, an underlying theme of tolerance and friendship. It makes me feel like a kid when I watch it, not just because I was when I first saw it, but because the film captures that innocence and playfulness that brings out the kid in all of us. It really is an amazing example of inspired storytelling and direction. And you want to talk legacy? Who didn't pretend their bike could fly?